Set up for optimum recording and production! 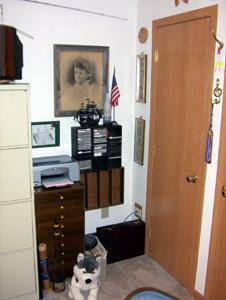 This studio is located at our house and is equipped with professional record equipment. All the magic happens in the Studio and the Sound Room. A project goes from inspiration to release here. 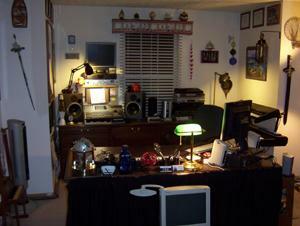 Housed in this room are different stations including the Music Production Station, Mixing Station, Mastering Station, Stereo Media Station, Library and Client Station. The Sound Room is right next door. This is the area where the inspiration takes its first steps into a song. 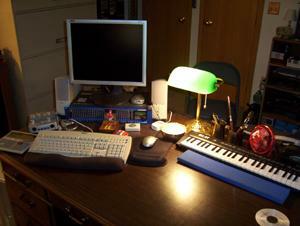 Synthesizers, samplers and drum machines are available as the music is created. The song is created into a score here. It is then humanized, made into a MIDI file and finally made into a Sequencer file. 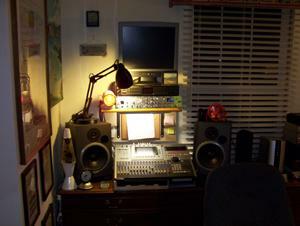 Starting with the recording process, the mixer station is the next to be used. 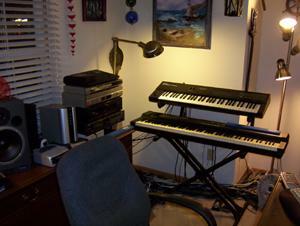 The synthesizer, sampler, drum machine and pre-recorded tracks are recorded into a digital audio workstation (which has a hard drive recorder.) Vocals and other instruments are then added to the recording. Once this is complete, the mixing process begins. During the mixing process, each track is analyzed and adjusted for the idea sound for the song. This includes volume, equalization, compression, reverb and other effects. Once the mix of the song is finished, it is recorded as a mix-down recording and sent on to mastering. 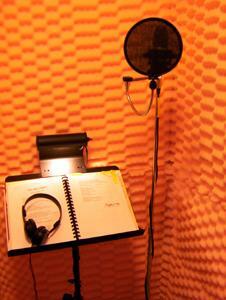 The Sound Room is used for any recording processes that require a high-quality microphone. To keep sound from reverberating and to keep outside sounds from getting in, the Sound Room is insulated with six layers of sound proofing. The inner room is lined with sound foam. Behind the sound foam (from the inside out) is a layer of pure cotton matting, dry wall, plastic sheeting, sound resistant fiberglass insulation, and an outer layer of dry wall and chipped-wood board. The last part of the journey for a song is at the Mastering Station. The mix-down recording is taken through various processes to make the song as a whole idea for listening too and to fit nicely in the collection that it will be included in. Some of these mastering steps include more equalization, compression, reverb and other effects, but this time they are applied to the whole song rather than individual tracks. Editing, normalization and other processes are also applied as needed. The result is a great sounding finished recording that is in par with professional standards. 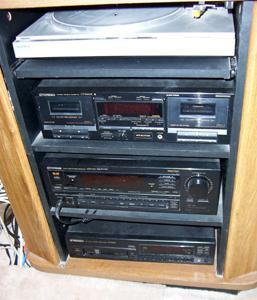 The stereo media station serves two purposes. First, it provides a turntable, cassette recorder, radio tuner, CD player, video cassette recorder, DVD player and television for studio usage. Second, it provides two alternative stereo speaker pairs to play audio through. The library is where all reference documentation and media are stored. Studio project records, client records, books, software documentation, hardware documentation, reference documentation, sound effects libraries, off-line sample libraries, off-line synthesizer libraries, sheet music, mix-down recordings and master recordings are stored here. During a studio session, the client may have a few times where they are not doing anything. This is where the Client Station comes in. Here the client can relax while being able to monitor what is going on with their song. 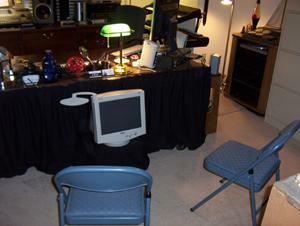 From here, the client also has easy access to the Sound Room.